When Felicien captured the 100m hurdles gold medal at the 2003 IAAF World Championships, it was the first global title won by a Canadian hurdler since Mark McKoy (1992 Olympic 110m hurdles). What followed was a tremendous international career. Just six months later she struck gold again this time in the 60m hurdles at the 2004 world indoor championships in Budapest. Her time of 7.75 seconds there set a new national record. Her dominance was clearly apparent to those close to the sport and despite a series of injuries and awful luck at the Olympics she returned to the medal podium at the 2007 IAAF World Championships in Osaka taking the silver medal. She would represent Canada once more at the IAAF world outdoor championships in Berlin in 2009 making the 100m hurdles final once again. Then, in 2010, she earned the silver medal at the IAAF World Indoor Championships in Doha. In all she wore the Canadian singlet at four world outdoor championships between 2001 and 2009. Domestically she was a ten-time Canadian champion and set the national record of 12.46 in Eugene, Oregon in 2004. 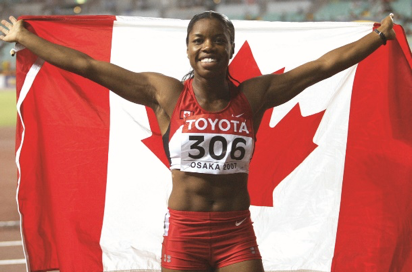 Her victory at the 2003 IAAF World Athletics Championships earned her the Bobby Rosenfeld Award as Canada’s Female Athlete of the Year.